John Oxley’s Dance Strike may lack the experience of his 13 rivals in the $75,000 Tropical Park Derby, but the 3-year-old son of Tapit will have no shortage of star potential when he takes to the Gulfstream Park turf course for the last of five turf stakes on Saturday’s 11-race program. Dance Strike is scheduled to make his stakes debut in the 1 1/16-mile turf stakes for 3-year-olds with a resume of just three races – but three very exciting races that include two eye-catching off-the-pace triumphs. 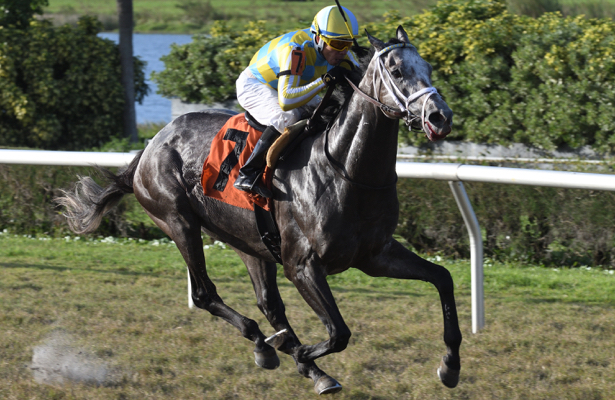 Dance Strike was unraced as a 2-year-old and debuted at Gulfstream with a 1 ¼-length victory Aug. 20. Six weeks later, the Kentucky-bred colt lost a photo finish in his first start against winners before overcoming considerable early trouble to rally from 10th and last to draw off to a stunning two-length triumph at Gulfstream Park West Nov. 18. Dance Strike was bought at the 2015 Fasig Tipton Kentucky October sale for $410,000. Casse had the option to run Dance Strike against older horses in a two-other-than optional claiming allowance, but opted for the Tropical Park Derby. Stuart Janney III’s Profiteer, a graded stakes-placed son of War Front trained by Shug McGaughey has been installed as a 7-2 morning-line favorite. Profiteer, who has won three of eight starts, is coming off a fifth-place finish in the Twilight Derby (G2) at Santa Anita Oct. 28, when he set a pressured pace before weakening in the stretch. Profiteer, who finished third in the Commonwealth Derby (G3) at Laurel prior to his West Coast trip, will be ridden by Hall of Famer John Velazquez. Chiefswood Stable’s Tiz a Slam, despite a seventh-place finish in the Commonwealth Derby, is one of the most accomplished entrants in the Tropical Park Derby. Prior to his Laurel outing, the Roger Attfield-trained son of Tiznow captured the Ontario Derby (G3) at Woodbine by 3 ¼ lengths. Rafael Hernandez is named to ride the multiple-stakes winner, who finished second in the Queen’s Plate. Ken and Sarah Ramsey’s Gorgeous Kitten will seek his first stakes win Saturday but has fared fairly well while competing in graded stakes in five of his last six races, including a back-to-back finishes in the Arlington Classic (G3) and American Derby (G3) at Arlington Park last summer. Jose Ortiz has the mount. Jeremiah Englehart-trained Small Bear, Chad Brown-trained Funtastic and James Jerkens-trained Secretary At War, who finished 1-2-3, respectively, in the Gio Ponti Stakes at Aqueduct Nov. 24 are all scheduled to reunite in the Tropical Park Derby. Durocher, Somekindofmagician, Mr. Bariley, Mr. Cub, Delarna, General McGooby, and Without Remorse are also entered. Zitman is an also-eligible entrant. Who won the 2.40 at Newmarket live on ITV TODAY?